It’s officially winter so that means it’s officially pie season, well in house it is. Over the years we have delivered many a cooking class and answered many questions about how to create the perfect pie. So we decided to consolidate all that info into a pie baking guide. To get you started we have a rather yummy new beef pie recipe. 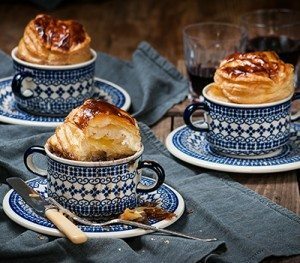 Beef, Mushroom & Red Wine Pie recipe . The beautiful Polish pottery featured in the photos below was kindly supplied by Elemental Barossa. Pie lids can be cooked with the filling or separate from the filling. If we are using puff pastry for a pie lid we want to see it puff, so we often bake it separate to the filling (see Beef, Red Wine Pie recipe). 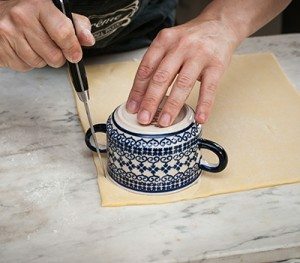 Keep in mind if you are baking a large pie and you place a piece of puff pastry over the filling and crimp the base pastry to the lid pastry you will not get amazing lift. For a start you have clipped it’s wings by crimping the two together and the moisture from the pie filling (on a large pie) will inhibit the potential lift. 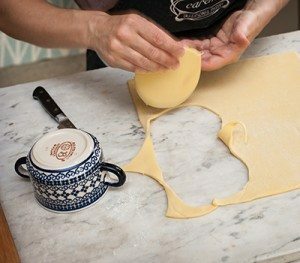 So if you do want that lift, use your pie dish as a template to cut the pastry lid and bake it separate to the pie filling. If doing so, I would not bother with a pastry base, the pie filling can be warmed through on the stove top, the pie dish pre-heated in the oven and prior to serving all is assembled and looks fantastic! Remember if using puff pastry on the top you need a really hot oven to start off to allow the moisture in the pastry to turn into steam, which allows the layers to separate and lift, 200c fan-forced for the first 10 minutes then reduce to 180c fan-forced for remainder of the cooking time (for non fan ovens increase temp by 20 degrees). Make vent in the top of the pie to release the steam and make it large enough so it does not close over during cooking. You can also try a pie funnel. Start by using an old fashioned shallow metal pie plate or dish. A great place to source pie plates are antique / second hand shops or even try Etsy. Make sure your filling is cold before filling your pie dish, a hot filling will melt the pastry before it’s had a chance to crisp up. It’s often a good idea to make the filling a day ahead, allow it to cool over night in the refrigerator. Use a pizza stone; pre-heat the stone and place your pie dish or dishes directly on the stone when baking. Bake from frozen, it gives the pastry a chance to crisp up before the filling starts to cook. Please note baking from frozen will not compromise the quality of your finished dish; add a further 10 minutes to cooking time. Make sure your pie filling is not too liquid, if your filling looks too wet strain off the sauce and reduce the sauce on the stove top until thick then return meat back to the sauce. For fruit pies use bread crumbs or crushed biscuits between the pastry and filling. It acts as a barrier protecting the pastry from the moisture of the filling. Stick with a shortcrust pastry for the base such as our Sour Cream Shortcrust. 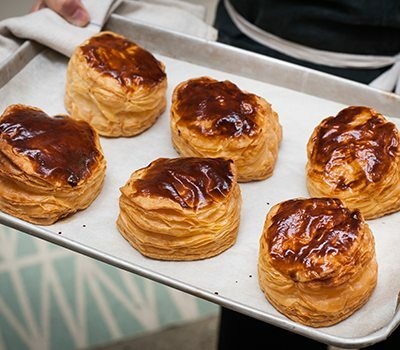 Puff pastry is better suited to pie tops.